The app to fix the notification bar is deleted. Can someone share this app? @bicho_zgz, the last version in the OP. Sorry but i new here and don't know what is OP. "OP" means "Original Post", besides, don't forget to be logged in into the forum, otherwise you won't be able to download the APK. 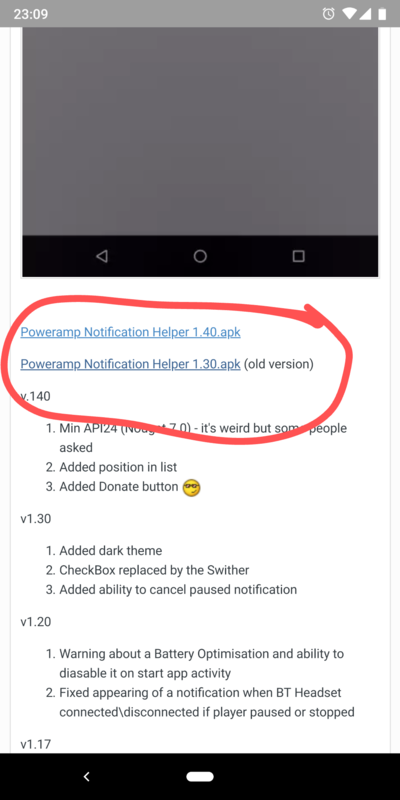 Meanwhile I've been using Neutron Player, hoping that some day Poweramp gets fixed with a stable release available at the Google Play Store. ? 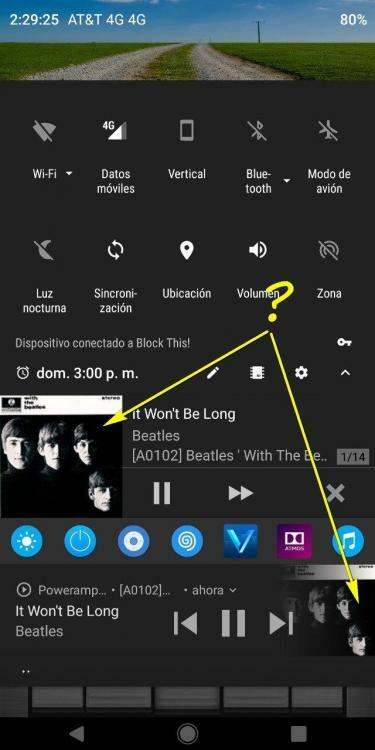 Thanks, i installed de app and the notification runs perfect, but now another problem, in the look screen dosent appear the widget. @bicho_zgz, the first post of the topic. Hi, i also have the same issue than Karballo. The pause button, don't change to play and reverse. I also use version 2.0 (final) not the alpha. I think on the alpha version that it work, but i have to confirm. After a reboot i have also to start the service, because it crashes. Very good app. Many thanks. Edit: i confirm that this 2 issues only occur with the play store version 2 final. With the alpha version all works as expected. You are genius. Thank you for your app! Can someone share the apk?? It is deleted from the OP. Thank you! Thanks, it's not perfect but it works for now ? So I have two problems. First: my notification on the lock screen will not show until my screen is locked + song changes. So if I lock a screen, notification will not be there, until the song changes. Second: the notification will pop sometimes randomly, whenever I am browsing FB or Chrome, anything really. It will pop at the top, I think it is meant to pop whenever the song changes - which it does, but randomly as well durning song playing. Any way to fix these issues? Thanks for the app anyway, as it is great! Hello. I'm using Poweramp v2 (I didn't like v3), and I got the "libpampffmpeg.so: text relocations" problem too, as you can see in the image I'm enclosing. I have installed the helper (thank you! ), but it has a strange behavor showing both the original notification and the new one. Am I doing something wrong?... The error pop-up note is still appearing every time I start Poweramp. Forget my last post. I decided give another try to PA v3 and problem solved. What made me back to v2 was that I found at first the new UI a little complex for me, and I had to say good bye to the good skin I've already bough recently. It also had some bugs, specially with my bluetooth devices. Now that I tried again v3 I don't regrate! It comes much more enhanced in Audio, and it worths to get used on the new UI. Still have some troubles with bluetooth, but I hope they soon will be solved. @clever_man just joined this forum to use your app and thank you! Had to revert back to PA v2 due to some operational annoyances in v3 that I can't work around. 2) your notification disappears after about 10 seconds DESPITE my having selected 'NEVER' in the settings. Have tried toggling it then restarting but it doesn't help. If you have any ideas on these, pls let me/us know. Again, thx very much for doing this app! yessir. followed your instructions to the letter. and know my way around android OS. open to any/all suggestions from you. thx!